Tom is a partner and lead consultant at Meridian and has more than 25 years of consulting and corporate experience. He advises compensation committees and senior leadership at client organizations regarding a full range of executive and outside director compensation matters, including compensation benchmarking, the design of short- and long-term incentive plans; severance and change-in-control arrangements; and corporate governance. His consulting emphasizes compensation strategy development and the alignment of pay and performance. 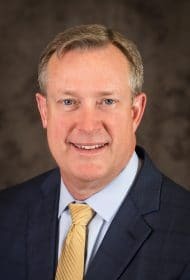 Tom began his career working at a global integrated oil and gas company, where he held roles in finance, strategic planning, operations analysis and executive compensation. Tom works with public and private companies across a broad range of industries. He has specific industry expertise in oil and gas, energy services, refining and petrochemicals, and engineering and construction. Most of his client relationships are at the Compensation Committee level but involve regular interaction with executive management. Tom’s global experience includes working with clients on various compensation and financial matters in the U.K., Europe, Latin America, Japan, Australia, Russia, and the Middle East. He has also advised clients on a number of significant corporate transactions, including mergers and acquisitions, IPOs and spin-offs. Tom is an active speaker in regional and national events with organizations including the NACD, and has written articles for the Conference Board, NACD’s Directorship Magazine and Meridian’s Energy Insights blog. Tom also serves as an advisor to a student investment club.